Advertising Intelligence brings your clients’ ad campaigns under one roof so you can see what’s working across various platforms. Uncover recipes behind rockstar campaigns, pinpoint what’s making your clients money, and use automation to stay on top of reporting. Bring your clients’ Facebook Ads and Google Ads campaigns under one roof to determine what’s working across ad platforms. Pinpoint what’s making your clients money. Combine live reporting and unique sales data to show your clients their true ROI. Cut down on overhead with automated reporting with the ability to provide your clients with real time performance reporting for their ad campaigns. Become the expert at interpreting what types of ads are giving your clients the best results. Unlock in-depth performance tracking and tools. Unlock the full power of Advertising Intelligence with Advanced Reporting. Analyze performance over time, be transparent with all fees and customize the dashboard. Make this the single source of truth for your clients’ advertising campaigns. 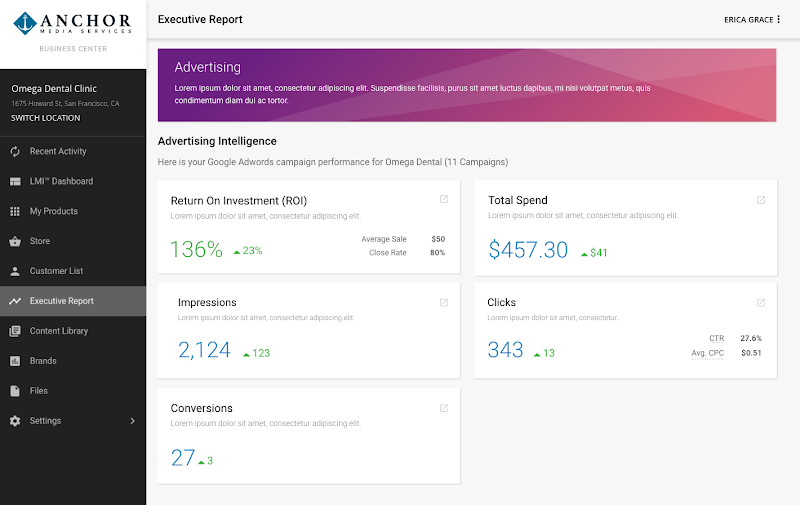 Advanced reporting gives you a full campaign data table, so you can compare ad campaigns in-depth and under one roof to determine what is working for your clients. All data is in real-time, so you always have access to the most recent information on ad campaigns. Advertising Intelligence adapts to the level of involvement required from each of your clients. Manage their PPC campaigns together, do it all for them, or let them do it all themselves. Already selling Google Ads and PPC? Looking to start? Regardless of your agency’s experience or size, our team of strategists are able to fulfill and deliver. Use our great white labelled team in conjunction with Advertising Intelligence. For us it’s that the clients can view both accounts at the same time while being inside the platform. Also for clients that aren’t tech savvy its very easy for them to understand the metrics. Josh Digital Marketing Collective Inc.
All time for me is saved by not having to go into Google & Facebook platforms to look at stats. I’d say per month I save maybe 30 minutes per campaign. Make your multi-client PPC ad management scalable. 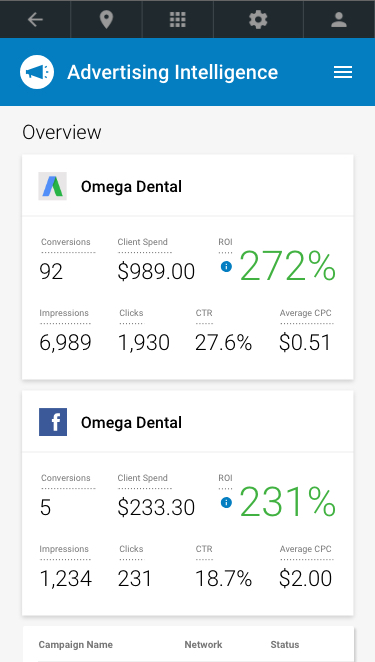 Advertising Intelligence gives advertisers one place to analyze ad campaigns for multiple PPC platforms— including Google AdWords search and display ads, YouTube video ads, Facebook ads, and Instagram ads. Bring your clients’ Facebook and Google Ads campaigns under one roof to determine what’s working across ad platforms. Compare campaigns side-by-side to see the big picture of your clients’ advertising efforts. Advertising Intelligence provides more than the traditional ad metrics and data points. By combining live reporting and unique sales data, you can show your clients their true ROI. Look at your advertising data with confidence. Smart insights and comparison tools help you become the expert at interpreting what types of ads are giving your clients the best results. Advertising Intelligence provides your clients with real time performance reporting across their ad channels. Automated reporting means you can keep your clients in the know without lifting a finger. Include your management fee in your client’s ad spend budget so their final cost is clear. With Advertising Intelligence you can set your markup per client and be sure your services are reflected in their final reporting. Bring your clients’ Facebook and AdWords campaigns under one roof to determine what’s working across ad platforms. 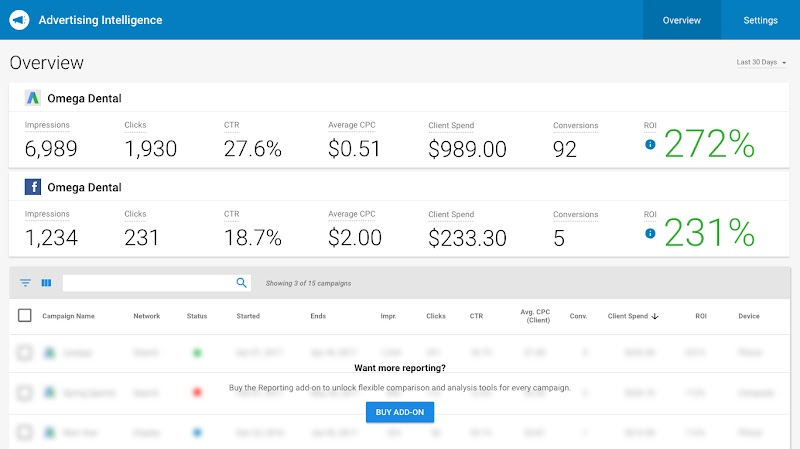 Compare campaigns side-by-side to see the big picture of your clients’ advertising efforts. Harness the power of Facebook with targeted ads appearing directly in the news feed.